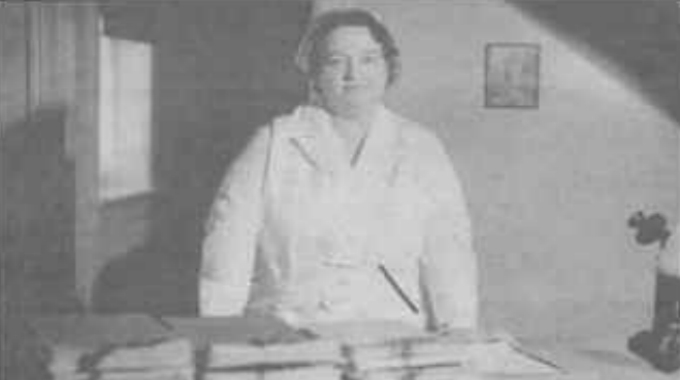 Rene Caisse (1888-1978) was an incredibly caring and selfless nurse who gave over 40 years of her life fighting for the right to naturally treat cancer patients. Although many doctors supported her work, the medical community as a whole was against having Essiac touted as a cancer cure. Had it not been for Rene this valuable formula would have vanished decades ago. In 1922 Rene was attending to an 81 year old patient who had a nasty scar on her breast. She explained to Rene that she had cancer and went to see an old Native medicine man who told her the cancer can be cured with an herbal remedy. She learned what this remedy was and made it herself. Within time her breast tumours diminished and she never had a re-occurrence. Thirty years later she was still cancer-free. Caisse asked the woman if she still knew the formula and if she would share it, and she did. It wasn’t until two years later than Rene used this formula as a remedy for her aunt’s stomach and liver cancer. Her aunt’s doctor, Dr. R.O. Fisher, stated that her aunt had six months to live and granted Rene permission to use the herbal medicine. After the medical profession gave up on her, this herbal remedy allowed her to live another 21 years. Rene and Dr. Fisher started experimenting with this tea remedy in a makeshift lab in her mother’s basement. Dr. Fisher inoculated a patient with the remedy but the man had a violent reaction to it. Although he was fine after a while, his cancer stopped growing and he lived almost four years. In 1926 eight doctors asked Rene to treat an elderly gentleman who was given about ten days to live, he survived six months. These doctors signed and sent a petition to the government of Canada asking that Rene Caisse be given treatment facilities. Not only was this denied, she was threatened with being arrested. Fortunately she never charged any patient for the treatment and she worked under the auspices of the doctors so she could not be arrested. Between 1928 and 1930, a government doctor, Dr. W. Arnold, was impressed with the results of this herbal remedy and asked her to perform research on mice. At this point the remedy was called Essiac (Caisse spelled backwards). She was given lab facilities and research was positive. 1929 Rene sensed that persecution would haunt her so she gave up her nursing career and devoted all her time to Essiac research in her Bracebridge, Ontario apartment. In very little time she was treating up to 30 people a day. She captured the attention of Dr. Frederick Banting. He had heard from a colleague, Dr. McInnis, that a diabetic patient was diagnosed with cancer and Dr. McInnis asked Rene to treat him. Rene would not treat this patient with Essiac while he was on insulin so the insulin was halted. In very little time the diabetes was gone and soon after that the cancer. Dr. Banting was so impressed with the results that he invited Rene to continue her research at the University of Toronto however she declined because ultimately she would have to disclose the formula. In 1920 the Canadian College of Physicians and Surgeons sent an agent to issue a warrant for Caisse’s arrest for practicing medicine without a license. The agent discovered that she was working with the approval of several doctors and never charged anyone so she was not charged. At the age of 44 she made headline news in a Toronto newspaper: “Bracebridge Girl Makes Notable Discovery Against Cancer.” This brought on another threat of arrest and imprisonment. Caisse was granted a hearing with J.A. Faulkner, the Minister of Health and at this hearing dozens of supporters including medical doctors attended. Faulkner allowed her to continue because her services were free. The Town of Bracebridge was so impressed with all the work Caisse was doing for so many people that they donated an old deserted hotel to her so that she could have adequate space to help treat people. This gave her five treatment rooms, an office, a dispensary and a reception area. She was treating anywhere between 300 and 600 people a week. Literally tens of thousands of people made their way to Bracebridge, Ontario seeking Essiac treatment for their cancer. Rene was attracting attention from as far away as Los Angeles. In 1938 supporters attempted to get a law passed to give Rene the right to treat cancer patients without fear of arrest. This bill was initiated in the Ontario government and was backed by a petition signed by 55,000 people. The bill failed by only three votes. This was believed to be because of alleged collusion between the Canadian Medical Association and the newly formed Cancer Commission. In 1939 Rene was forced to sit in a public hearing held by the Cancer Commission in Toronto. She brought almost 400 patients to testify yet the Commission heard only 49. They refused to give any merit to Essiac. She continued to treat cancer patients until 1942. At this time the pressure became very intense and it eventually got to Rene and she suffered a nervous breakdown. 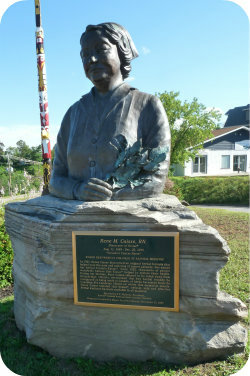 She moved to North Bay with her husband and in 1943 he passed away. Rene remained quiet up until 1958 but she never turned away anyone seeking help. In 1958 the Cancer Commission requested that Caisse provide them with the Essiac formula and she refused. 1n 1959, Ralph Daigh, an editor with Fawcett Publishing brought attention to Caisse when he arranged to have Essiac investigated at a Boston hospital. Daigh believed the medical industry was suppressing valuable information about Essiac. As a result, Caisse worked with Dr. Charles Brusch, John F. Kennedy’s personal physician. He believed in her work and recommended she work with Sloan Kettering, one of the largest cancer research hospitals in the world. She went there but not for long as she knew that there would be more pressure to divulge the formula; she also knew that if the formula got into the wrong hands it would ‘magically’ disappear. Interestingly, in 1989, Dr. Brusch publicly stated that he treated his cancer successfully with Essiac and regretted that John F. Kennedy did not live long enough to help influence the medical community. 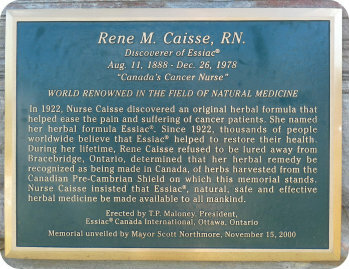 Throughout the 1960’s and ‘70’s Rene Caisse approached some pharmaceutical companies in an effort to get them to become involved with Essiac. Everywhere she went she clearly stipulated that Essiac would have to be used immediately for cancer patients but of course without knowing what herbs were in it and not doing their own clinical tests; they refused. Rene Caisse spent most of her lifetime helping people treat their cancer. She was constantly fighting a system that was designed to be complicated by politics and ruled by greed of the medical establishment. In 1977 she sold the formula to the Resperin Corporation in Toronto. She also gave the recipe to two friends, Gilbert Blondin and Mary Macpherson. She also gave the formula to Dr. Brusch in Boston. At the age of 90 Rene Caisse fell and suffered a broken leg. She eventually was admitted to South Muskoka Memorial Hospital and passed away on December 26, 1978. A very interesting video on Essiac including footage of Rene Caisse can be viewed at YouTube. The four herbs in Essiac are burdock root (53%) , sheep sorrel (36%) , slippery elm bark (9%) and turkey rhubarb root (2%). Olsen, Cynthia (1998). Essiac A Native Herbal Cancer Remedy. Lotus Press. I have studied, Renne and have found one supplier that sells the 4 herbs she used in her original recipe. I buy the herbs and follow the recipe for her original Essiac Tea. It is a wonderful formula and has gotten rid of my cervical stage 4 cancer about 10 years ago. Thank you for this great historical post Karen. I got interested in original Essiac Tea and wish to use as a preventative dose. I am confused whether it is ok to use as a preventative dose or not. The market is full of claims of original formula. Even Dr. Gary Glum has shared the original formula on website. For me, the key is to buy 4 genuine ingredients mixed in powered form so that the tea can be brewed for usage. Interesting article I hadn’t heard of Rene Caisse before, thanks for sharing. indeed the formula will assist in prevention, let food be thy medicine and medicine thy food. the plant kingdom is our supply and also the supply of the animals we eat. the root of all Dis EASE is simply the lack of oxygen to the cells. for prolonged periods of time. block the transfer of oxygen to the cells. healthy PEO oils simply allow the transfer of oxygen to the cells as nature intends. herein lies our remedy 🙂 healthy Parent Essential Oils coined by Professor Brian Peskin can be found in all plants, nuts, grasses, seeds and flowers. so when you purchase an oil make sure it is cold-pressed in an opaque glass bottle and preferably stored in a refrigerator at a natural health food store or otherwise. Plants give us all we need. Things made in a plant can destroy our health. Funny how that works. 🙁 Rene is a true Canadian hero who deserves to be in the history books.